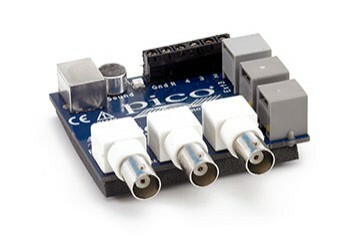 PicoScope dedicates most of its display area to a scope view, which is a conventional plot of voltage against time. All the controls you need are arranged around the display area in the toolbars and menus. The most commonly used commands are also available in a context menu (right-click on the scope view). The x-axis measures time. It is marked in multiples of seconds. By default, when triggering is switched off (Trigger=None in the triggering toolbar), the x-axis starts at time t=0. If you switch triggering on (Trigger=Single, Repeat, Auto, Rapid or ETS), time t=0 is placed in the middle of the x-axis to allow pre-trigger data to be shown in the left half of the view and post-trigger data in the right half. To move the trigger point (and therefore the start of the x-axis), drag the trigger marker. The y-axis usually measures voltage (although it can be scaled using a Custom Probe to show other quantities instead). Each channel has a y-axis that can be dragged up or down to create an offset. It also has an offset/scaling button that opens a control panel, allowing you to enter exact offset and scaling parameters. As an alternative to the offset dialog, you can drag the vertical axis of any trace to reposition it on the screen. You will also find the Bring to Front and Send to Back buttons, which change the ordering of the traces on the screen. If the trace of interest is hidden by other traces, Bring to Front will make it visible again. The measurement tool tip is an information box that appears when you click on the scope view. It tells you the location of the pointer on the time axis and on all the voltage axes. The rulers can be dragged into place on the scope view to display time and voltage measurements. When not in use, only the ruler handle is shown, in a color matching the trace. Up to two rulers can be dragged into place for each channel. The ruler legend shows measurements for all rulers in use. Where pairs of rulers are used, the legend also shows the difference (delta) between them. The lock button ties the two rulers together so that you can drag them without altering the delta between them. If two time rulers are positioned, an additional frequency legend shows the inverse of the time difference between them. The units can be set to either hertz or RPM. This control sets the time interval across the horizontal axis. By default it is scaled in time per division. As there are ten horizontal divisions, the total collection time is 10 times the time per division. In the Tools > Preferences menu there is a setting to change this control to show total collection time instead of time per division.